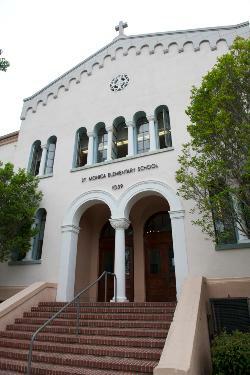 As a ministry of the St. Monica Catholic Community, St. Monica Catholic Elementary School (SMCES) welcomes all applicants. However, due to limited class size, registration priority and enrollment consideration is given to registered, active, and participating parish families. All other families are considered based on available class space. Registration of currently enrolled, returning students in Transitional Kindergarten through 8th grade will take place in January. New student application for Transitional Kindergarten and Kindergarten will begin in the Fall prior to the year of intended enrollment. New student application for grades 1-8 will begin in the Fall of prior to the year of intended enrollment and will depend on availability. Our admissions policy requires prospective parents to complete and submit the application forms, pay the application fee, submit a current report card and all required health records, submit a baptismal certificate (only if applying for the discounted Catholic Tuition), and to meet with the SMCES administration and staff. SMCES, mindful of its mission to be a witness to the love of Christ for all, admits students regardless of race, color, or national and/or ethnic origin. While SMCES does not discriminate against students with special needs, a full range of academic services may not always be available to them. The principal and pastor reserve the right to determine if SMCES is able to meet the needs of all applicants.